High Probability Trade: What do OIL, GOLD, and TECHNOLOGY STOCK's have in common? What do OIL, GOLD, and TECHNOLOGY STOCK's have in common? 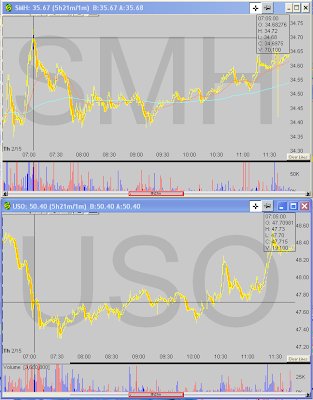 Pull up a USO and GLD chart and put on your pointer-tracking device students. Can anyone tell me who leads between the pair? Teacher-Yes Billie, you are correct for this particular day, however this is not always the case. For the purpose of this exercise I want you all to recognize the positive correlation between these two commodities. Teacher: Now class, pull up SMH and tell me what you see between USO and SMH? Student: Is SMH,,,,like,,the opposite of USO or something?? Teacher: Well Suzie, you have a very kean observation, although USO is an oil ETF and SMH is a semiconductor ETF, they behave with a very noticable negative correlation during certain times of the day; moreover, correlations between pairs and anit-pairs is seen best when volatility and volume are high, particulary in the first 2 hours of trading. Teacher: Class, we will pick up on this subject next week with a further indepth look at these pairs and how to spot signs of reversals using volume analysis. Also, we may look at how USO and SMH's anti-correlation can be an indicator for reversal signs when trading NQ.